Spooky Day brings out the flirty in Don and Xia. 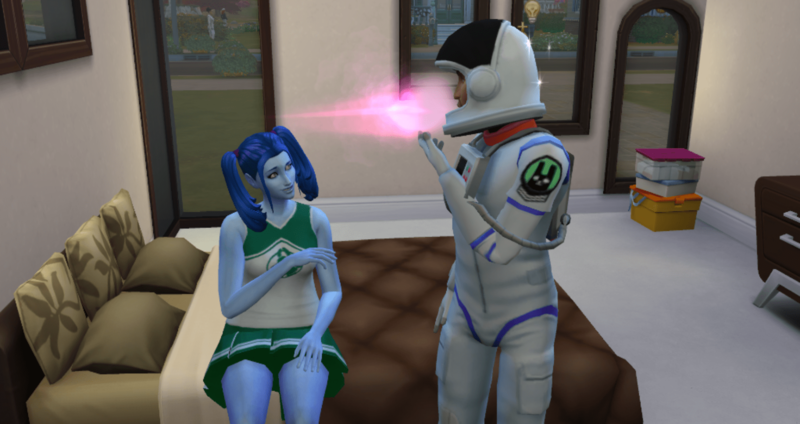 Xia dresses up as a cheerleader for Don and Don dresses up as an Astronaut for Xia. One might think they are playing out some workplace fantasies. 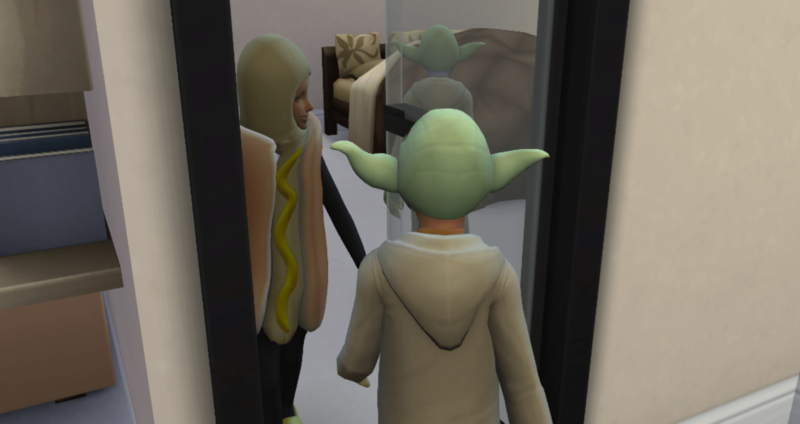 The kids only have two costumes to choose from – Yoda and a hotdog. They really need better (more) options. There are other options in the dresser but they don’t count as wear costume for the tradition. That option only gives these two. And yes, that is some hanky panky happening behind Olly – again. That boy is going to need some serious counseling. Of course, one thing leads to another, and Don and Xia don’t wear their costumes for very long. 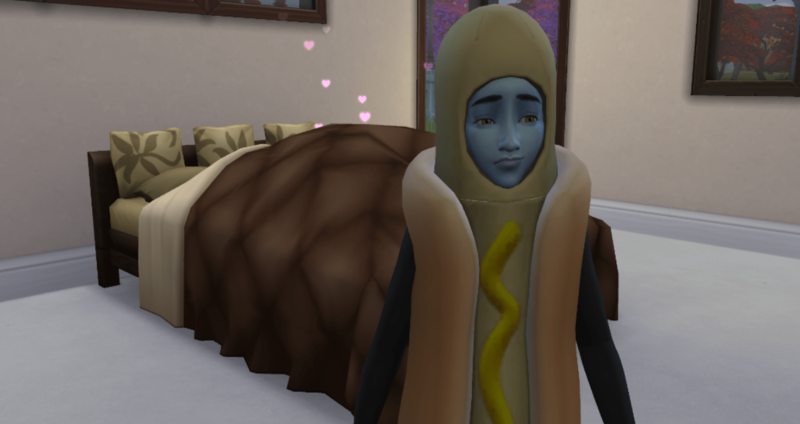 The kids haven’t left for school and every single one of them head into the bedroom to talk to Don before school. Mistake, big mistake. Olly was the first one in there, the others were right on his heels. Every single one wanted to talk to Don. None of them could wait and they were all shocked. 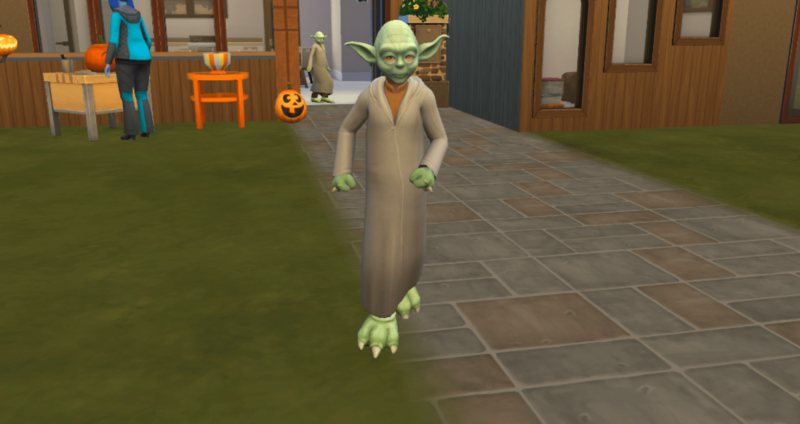 But by the time the last two Yodas walked in, they just stood there and waited for the big finish. They didn’t bother to leave. They just stood there and watched. Orion acts out by making ANOTHER mess. He doesn’t even try to hide it. 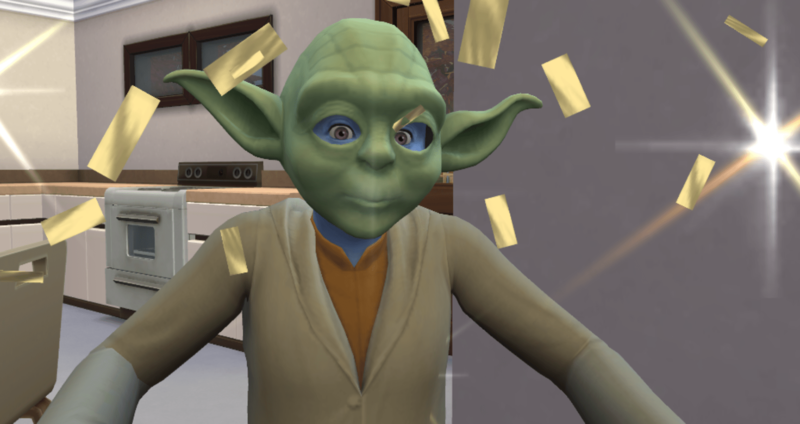 He was the last Yoda to walk in on Don and Xia. 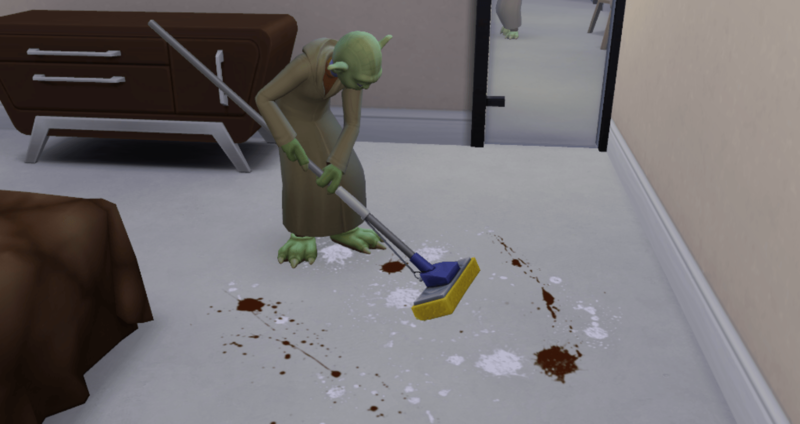 Don scolds him and makes him clean it up. Then sends him off to school. Finally the kids heads off to school in their costumes. Xia and Don make pumpkins as I try to figure out how spooky traditions work. It isn’t like other holiday traditions – by talking about it. 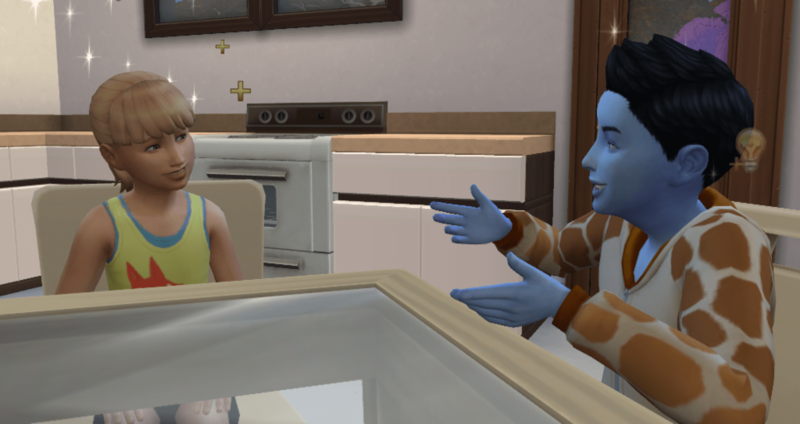 They actually have to talk to ghosts and vampires and aliens. They don’t know any ghosts and vampires and aliens. So, they buy a pumpkin carving station and they each carve a pumpkin. 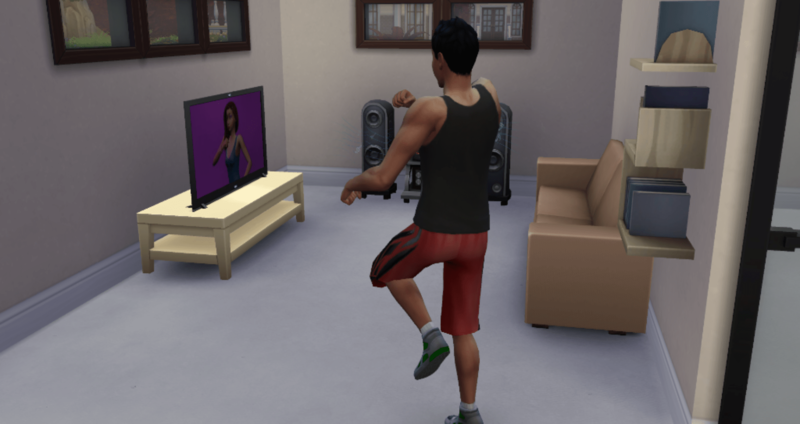 Don hasn’t had the money to buy exercise equipment yet so he has a choice to go jogging or to use the workout videos on TV. This is the longest any of my families has ever been this poor. Normally I have made better decisions and they have money by now – at least enough to buy what they need to skill. 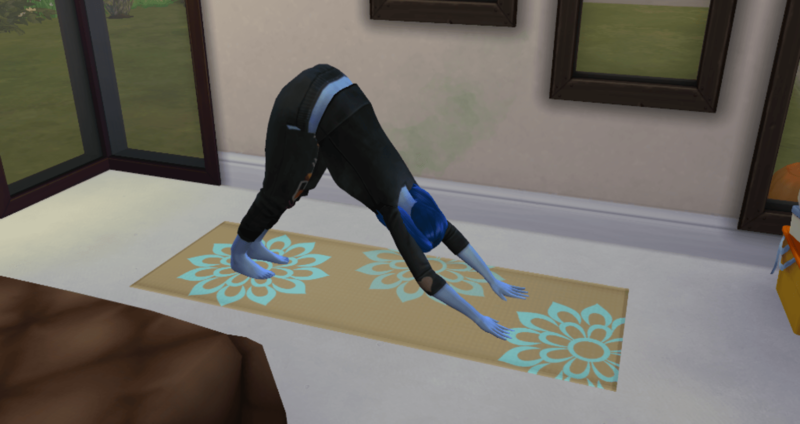 They do spring for a yoga mat for Xia since she is spreading and needs to do something to keep her busy since she has completed her aspiration. 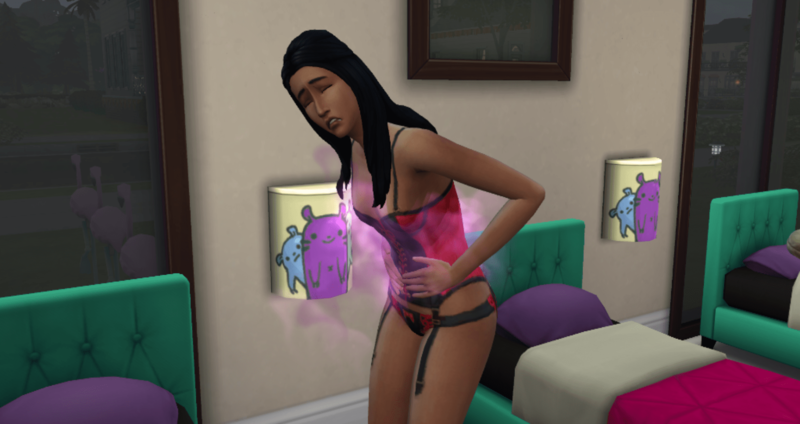 And if she is going to be doing something to stay busy, she might as well do something to stop the spreading. More messes. I cannot wait for these kids to become teens. Now they are playing in trash. Don hasn’t even had time to salvage any parts from that. We need the parts to sell for cash. 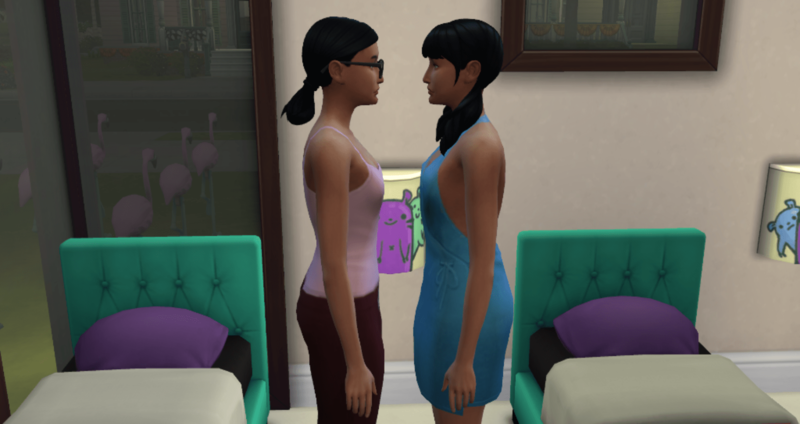 I am working on the kids’ aspirations and I turn around and catch Don and Xia getting all smoochy. Aren’t they cute? 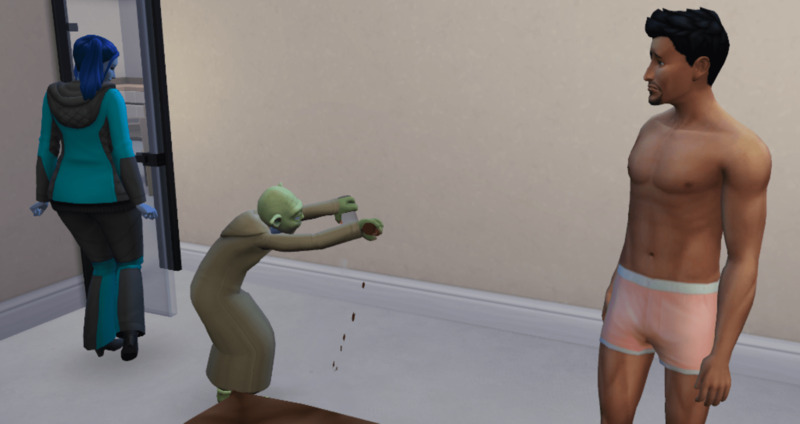 Don still lives with the trapped moodlet, but he loves Xia. Or, he loves the smoochies. Either way, he always has a tension that doesn’t go away, but at least these days it doesn’t overwhelm all of the other emotions. 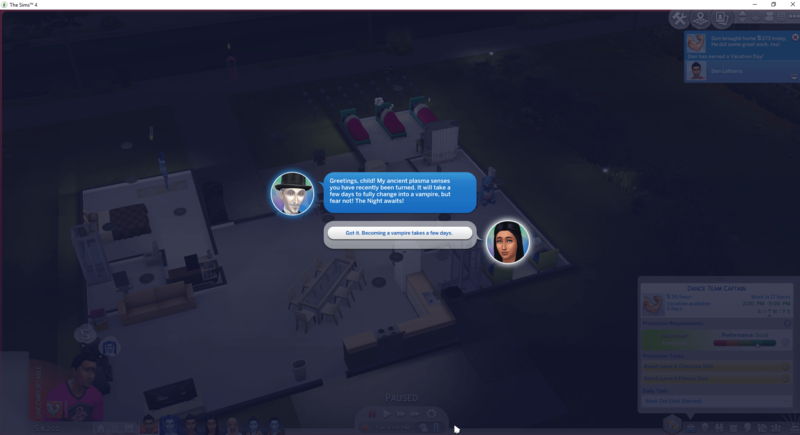 Olly finishes up his social aspiration by making friends with Bella Goth. Five kids and I randomly roll three mentals and two socials. Seriously don’t like those odds. I could have lives with a creative and physical in the bunch. 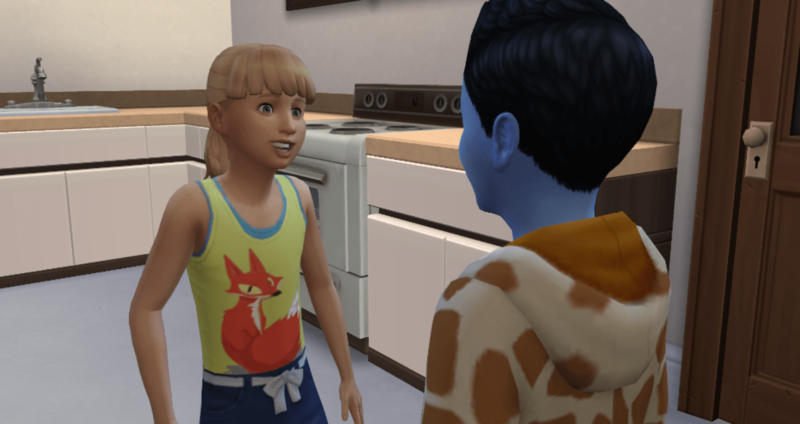 Meanwhile, Orion is chatting up Carlee Landgraab. 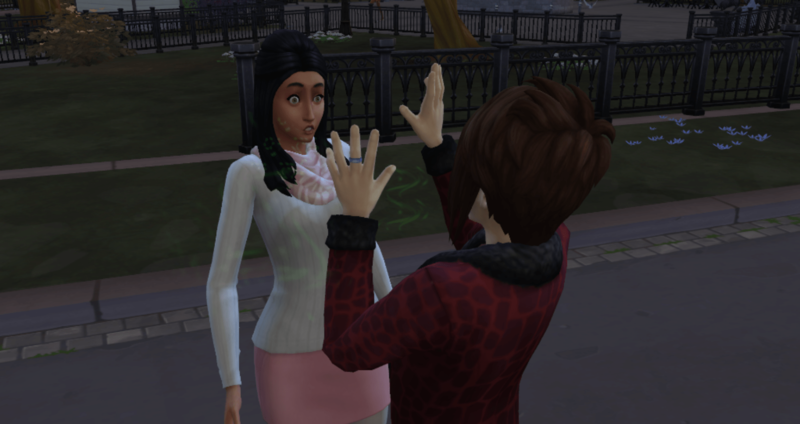 If they can maintain their friendship (and because it looks like he will be the heir), Carlee will be the spouse (or at least the first choice, if Orion approves). And she is cute. 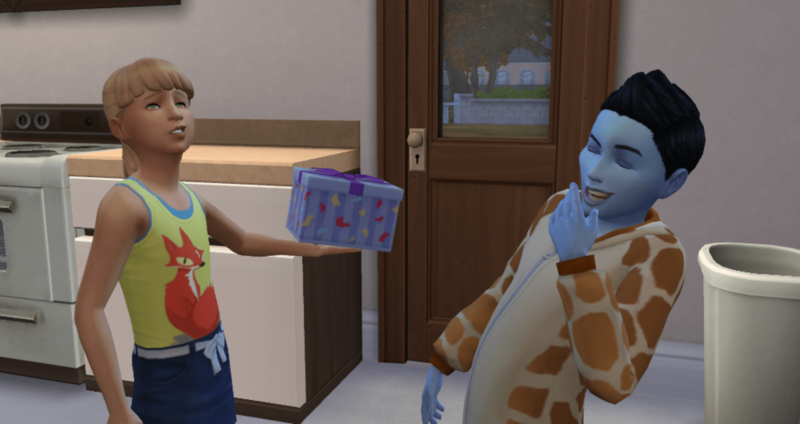 Orion gives her a prank gift and she displays a good sense of humor. When she opened it (and I missed the picture) the rubber snakes jumped out. 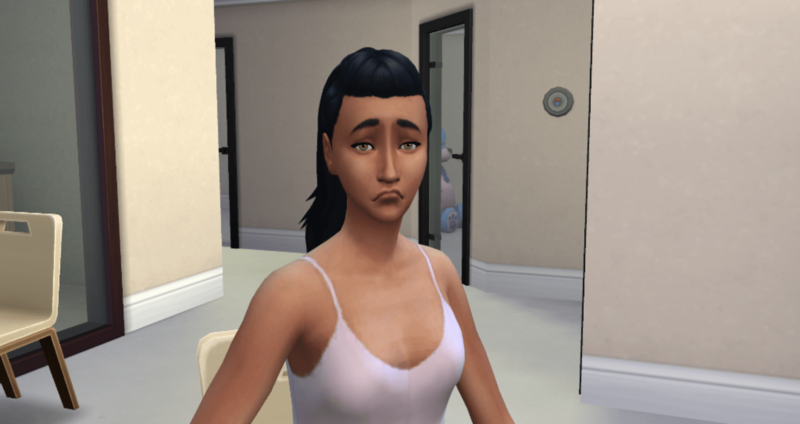 Oriel is the last of the children to complete her aspiration. The boys finished their social aspiration before Oriel finished her mental aspiration. And readers of my Bladderstones knows how much I hate the social aspiration. So, that is saying something about Oriel. 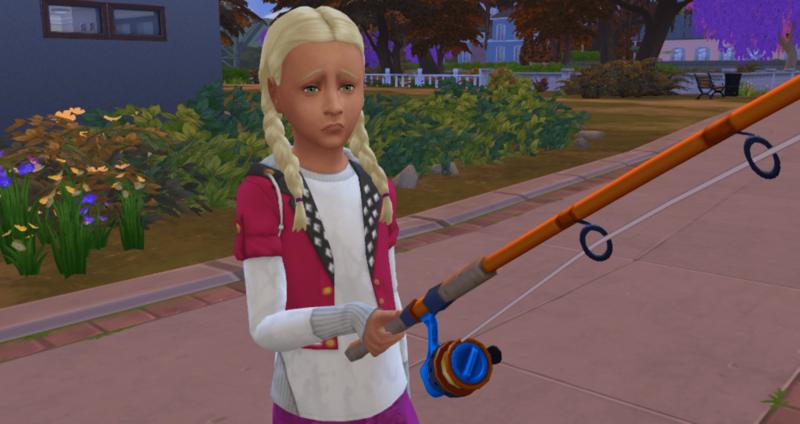 I sent her out to fish for awhile just for something different to do, and because I can sell the fish. Have I mentioned how much they need the money? More smoochies. 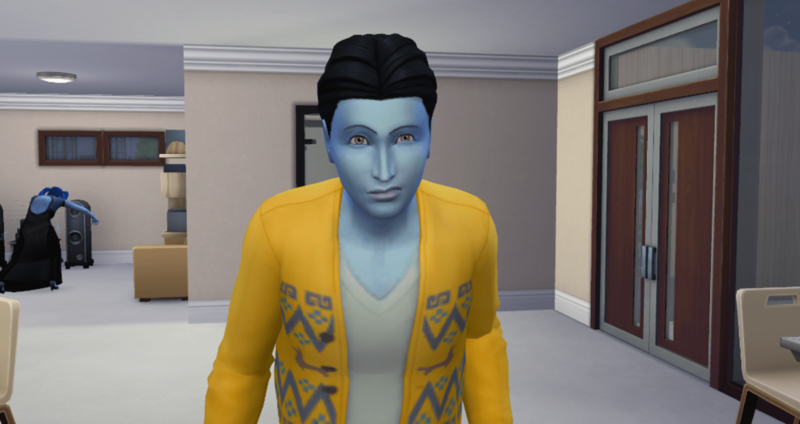 Don needs charisma so he splurges on Great Kisser and kisses his way to max charisma. And wow – look at those spots. Well, he almost gets all of the way there before he gets rejected. 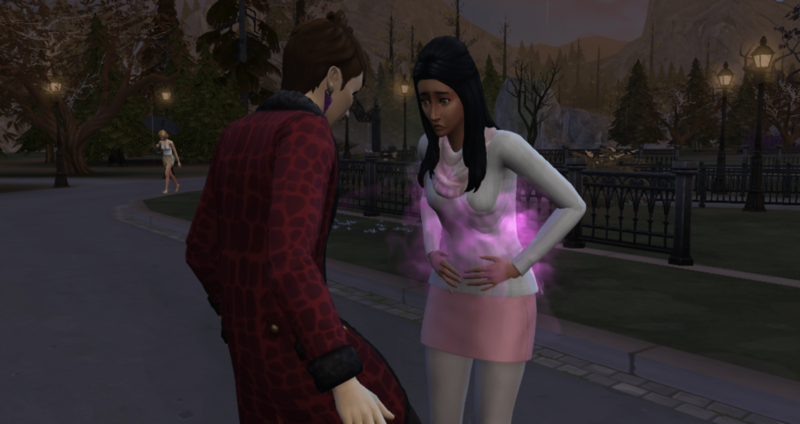 She rejected him one interaction short of level 10 – she peed herself on the way to the bathroom. So did he… After they both showered, he came back, kissed her and maxed charisma. Buffy added Snob to her Self-Assured and rolled into Outdoor Enthusiast. This will work out with the Outdoor Retreat bonus. 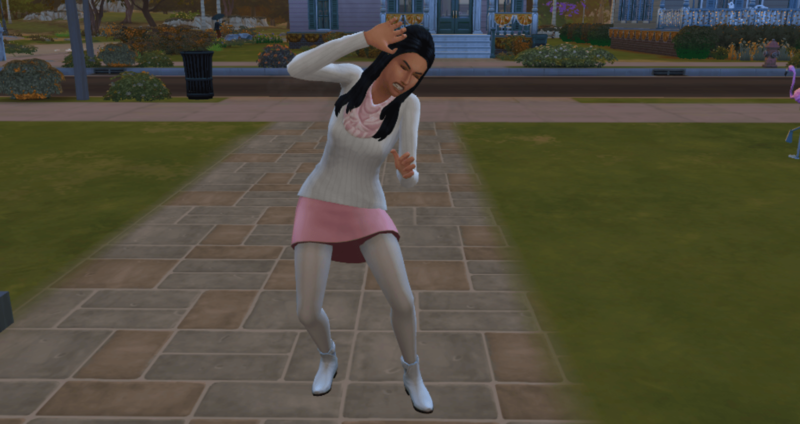 Bunny added Clumsy to Cheerful and rolled into Master Vampire. I was worried this might happen but I think this is doable. Yes, Bunny, my feelings exactly. At least it is the knowledge aspiration and not the family aspiration. 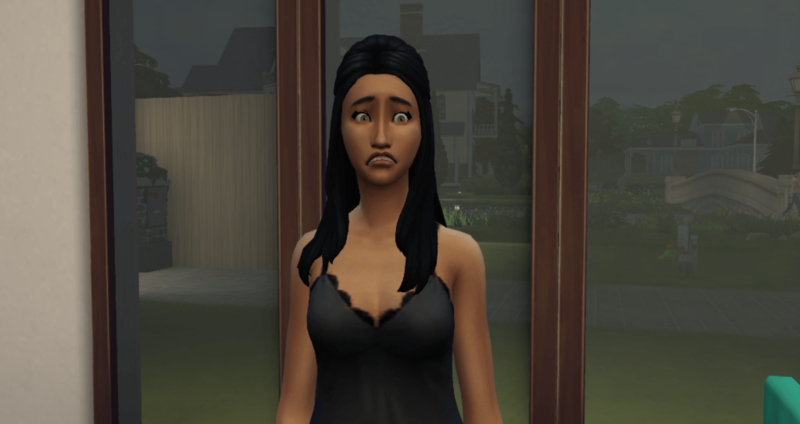 I added a third bathroom to the house and they still choose the same bathroom to use. Embarrassment is a common emotion in this household. The family finally buys their first computer. Bunny uses it to search for information on vampires. 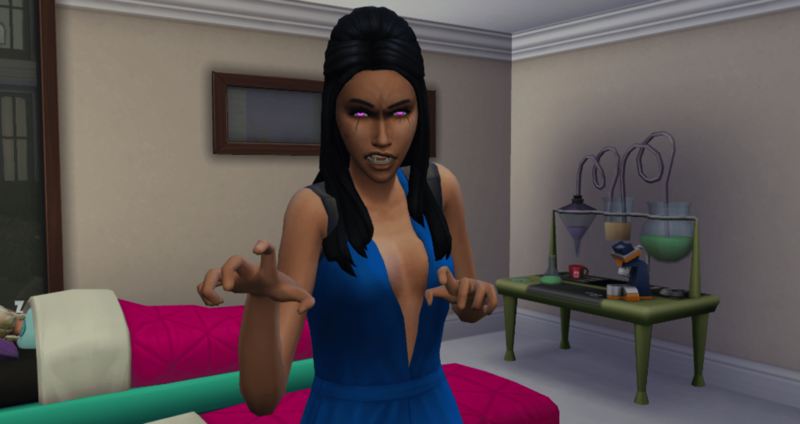 She has been watching Buffy the Vampire Slayer and has been identifying with the vampire community. 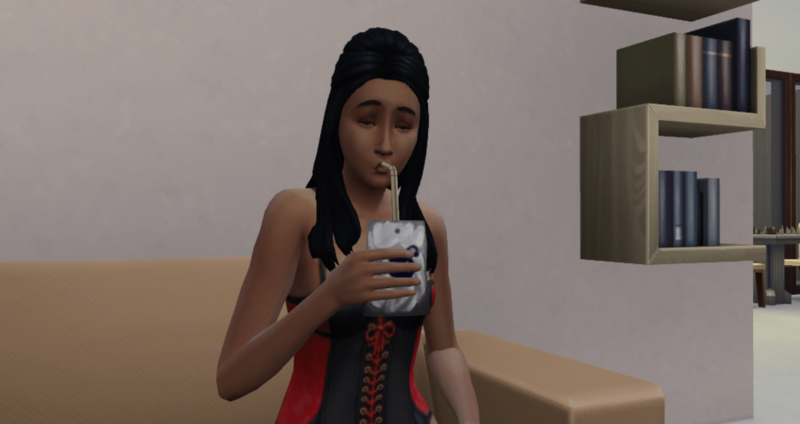 After bingeing for the past few weeks, she is on season 7 and wants to know everything there is to know about vampires. 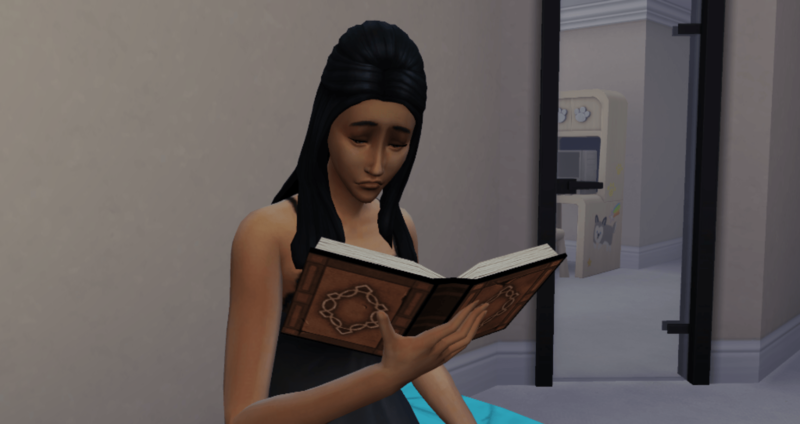 She evens buys a vampire tome – the Encyclopedia Vampirica Volume 1. 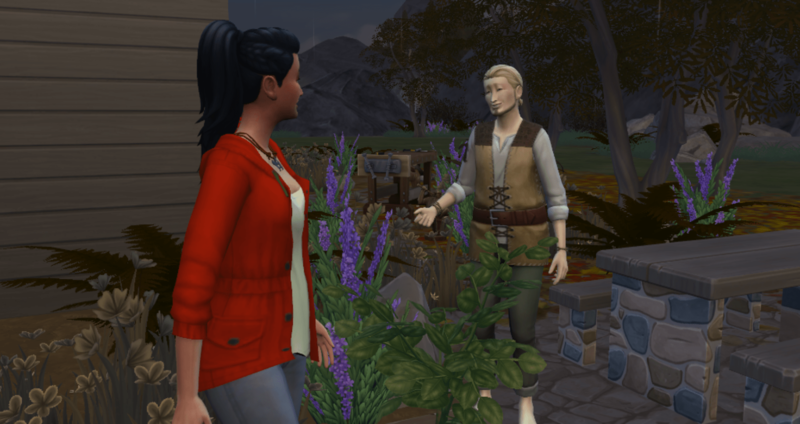 Wasting no time, Bunny heads down to Forgotten Hollow where she meets Caleb Vatore. 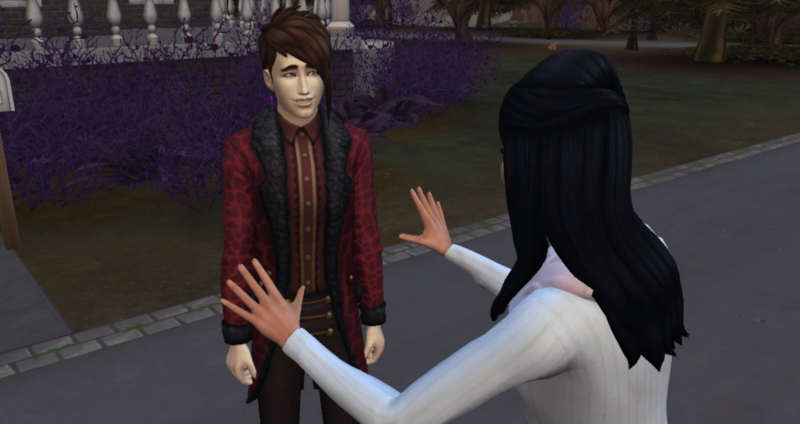 She chats with Caleb for awhile and eventually the conversation makes its way around to becoming a vampire. Bunny asks Caleb to turn her and he agrees. The deed is done and Bunny heads home. She receives a message from the Count that it will take “a few” days for the transformation to be finished. Oh joy. 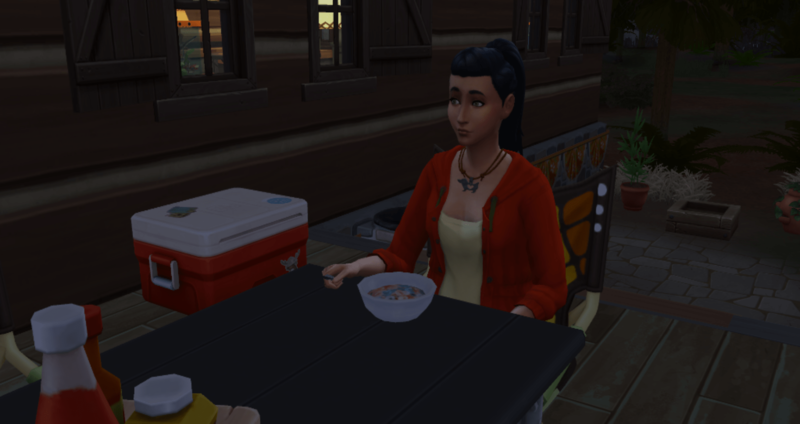 While we wait for Bunny to transform, Buffy heads to Granite Falls to complete the first tier of her aspiration. She manages to get it done with an hour or two to spare – 1 day on vacation, 10 unidentified plants and 5 fish. Back home in time for Bunny’s transformation in a room filled with windows… Bunny and Buffy will switch beds so that Bunny is in the middle bed and not up against all of the windows. I am not building a basement if I can get out of it. Nice dark costume Bunny. Maybe we will change that, maybe not. 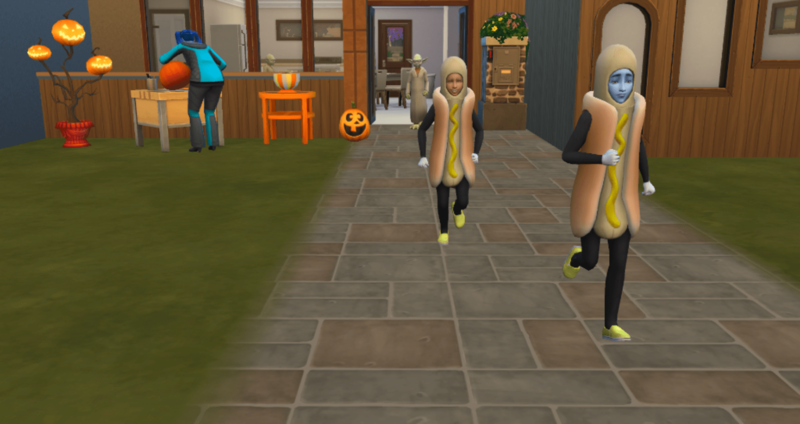 Soon after Spooky Day it is HarvestFest. 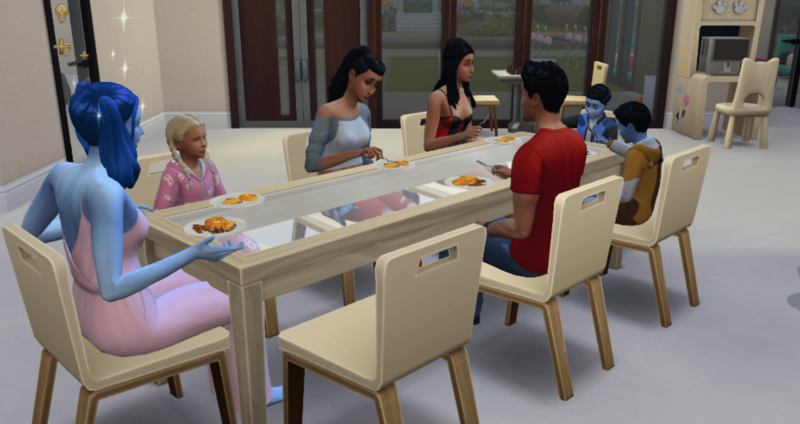 Because Don and Xia work in the evening, the family has their Grand Meal for breakfast, Xia gets up early and cooks a big breakfast and then calls everyone to come eat. 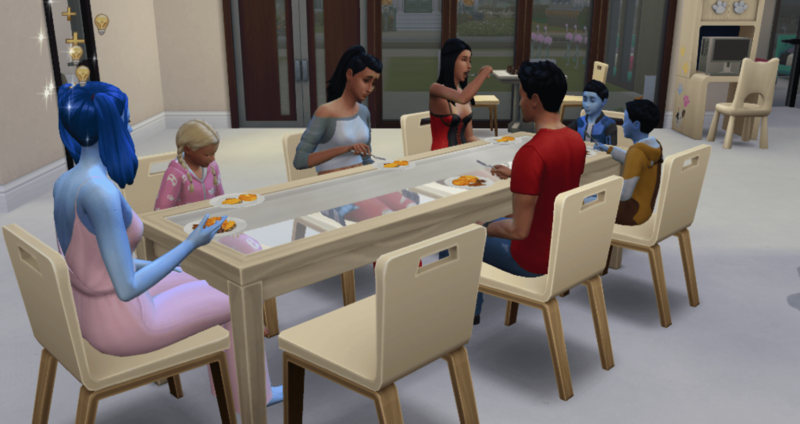 We have the first family meal, or at least the first one I can get a good picture. And as it goes with most family pictures, someone is stuffing their face. It just so happens, in this picture it is the newly turned vampire. Who has not yet spent her points, so she can still eat human food. She will be losing that ability soon as that is always the first weakness my vampires take. So she needs to enjoy it while she can. In the future she will be puking after these grand meals, if she has to participate. Bunny makes her first plasma pack and gives it a taste. 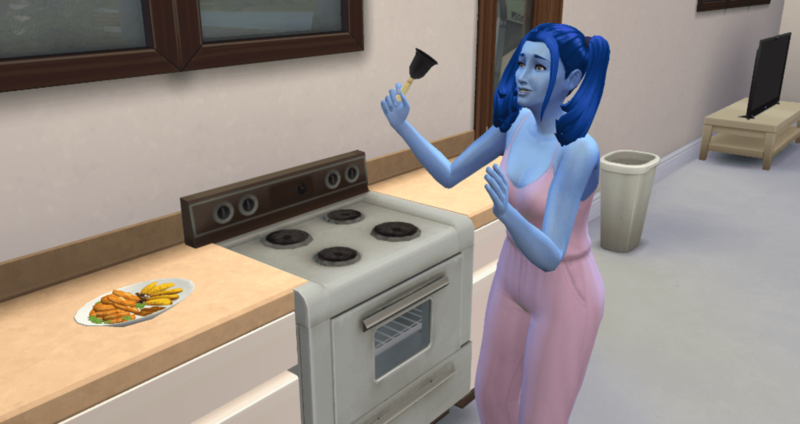 She makes it out of fish that she, or one of her siblings caught, using a recipe she learned from her vampire encyclopedia. Hmm, not bad. But Bunny hasn’t yet had fresh blood – that is still to come. 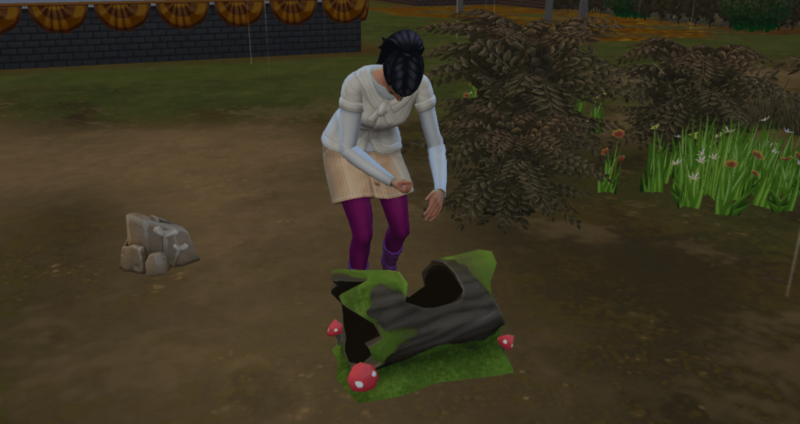 Being a nice sister, Buffy goes out to find a frog for Bunny to use to make another pack. Really nice sister as it is raining. Bunny decides to go see Caleb for some vampire training. While she is there she gets a taste of fresh blood for the first time. This is so much better than the plasma packs. 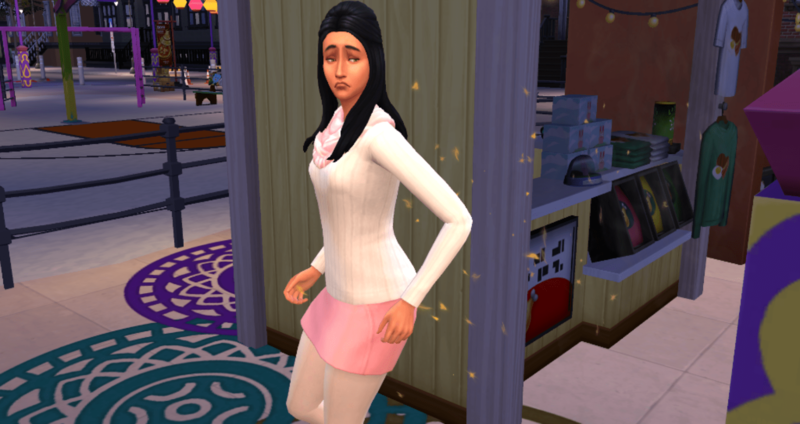 I am definitely going to need to change her dark outfit – those boots do not go with that jumper. 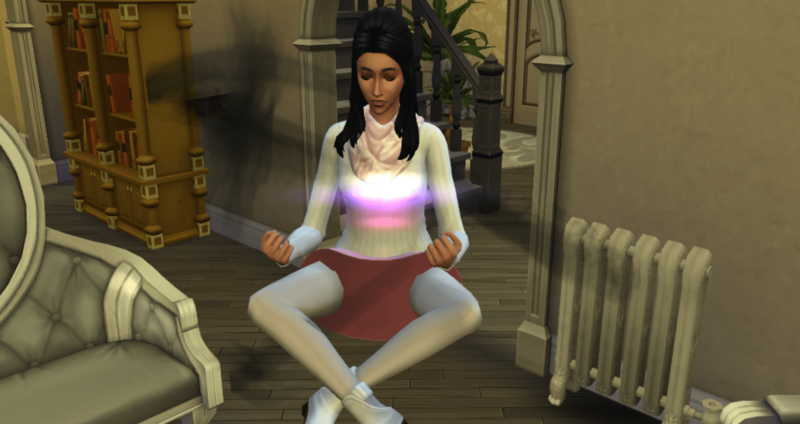 After training with Caleb she meditates and then heads home. 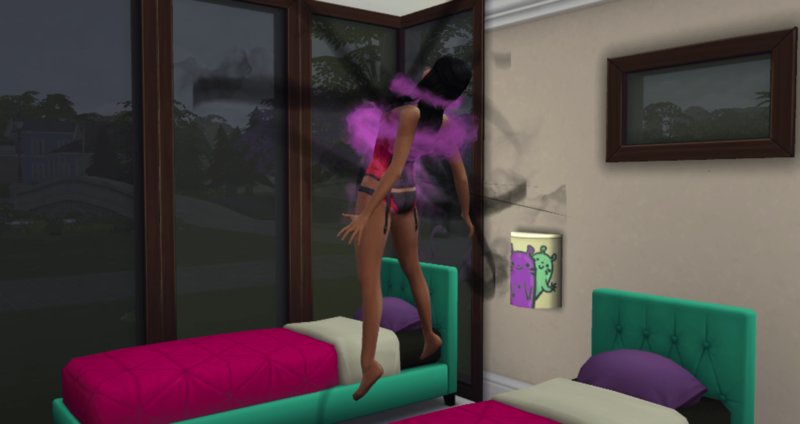 She is now a something vampire and has completed the first tier of her aspiration. Woot! Getting home I find Olly playing in the rain. For once he is not making a mess. IT BURNS! Get in the house, dumbass! Of course it burns. You don’t have thick skin yet. 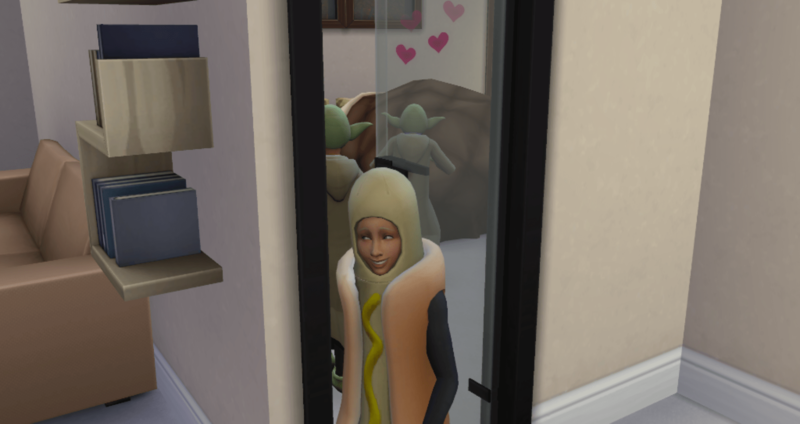 She came home from school and just stood there. Umm, Olly, clothes, please. He is embarrassed and yet stands there naked. Then he goes into the bathroom where Bunny is taking a bath and gets very embarrassed at seeing her naked. And he is still naked. 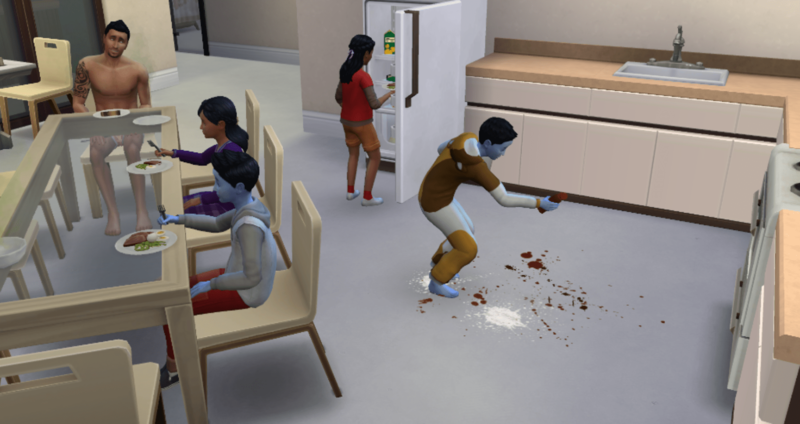 It is time for the Spice Festival so all of the kids head out to do their thing – and it is the Night on the Town holiday so the family gets as two for one. Don and Xia are at work, so they will come later. 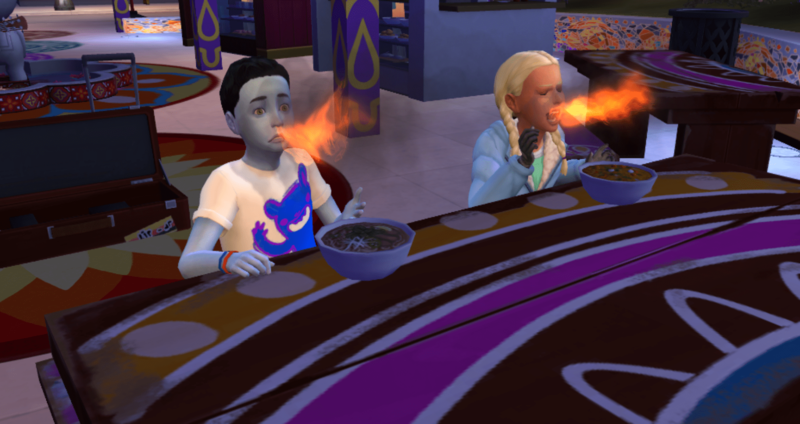 Oriel and Olly eat spicy food – Orion was talking with Carlee. All of the food was free but none of the plants were harvestable – which doesn’t matter to me since I am not gardening any more. It is 8pm and still Bunny is smoldering. She has to run back to the karaoke bar to get out of the non-existent sun. 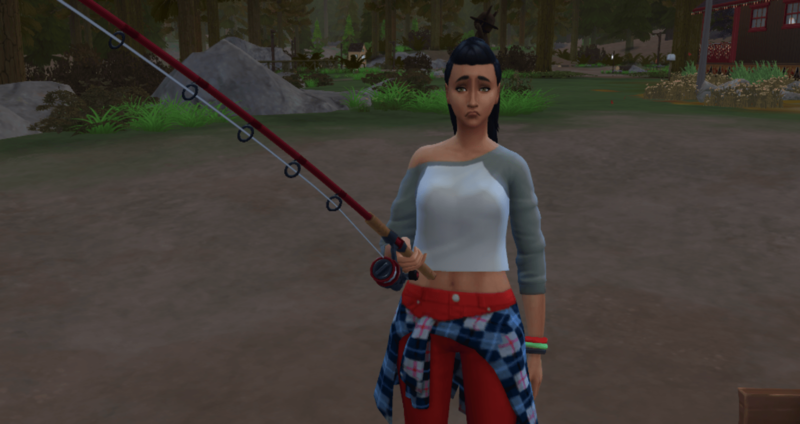 But she bought the requisite T-shirt so she checked off the requirement – this was a social event she was invited to by Caleb. 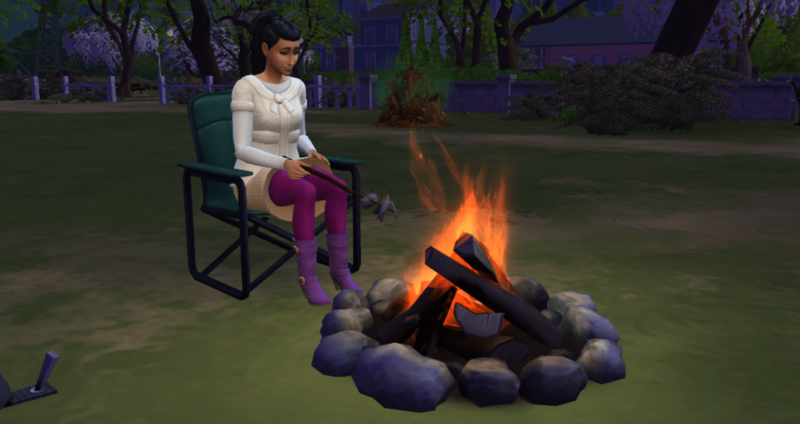 After they finished the joint holiday/festival, Buffy went back to Granite Falls to find some beetles so she could roast them over a campfire in order to complete her next aspiration tier. I guess in all of the times I have done this I didn’t realize she actually had to have the beetles in her possession and it wasn’t like roasting marshmallows where they just automagically appeared. She takes the opportunity to collect as many unidentified plants as possible and she meets the hermit while she is there. 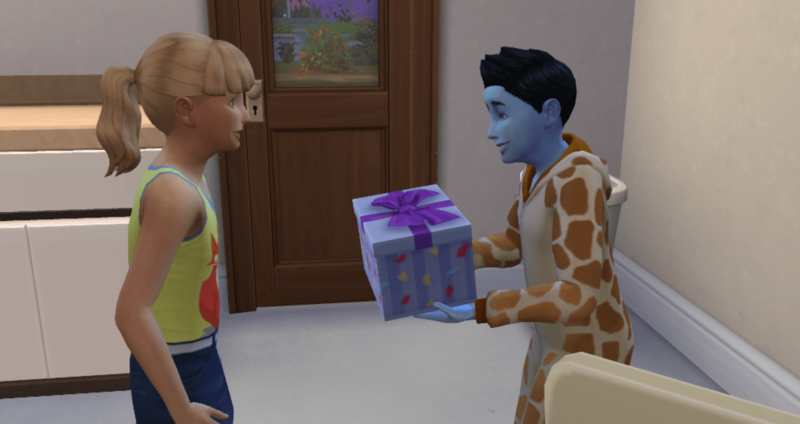 When she gets the notification that it is time for Oriel and Orion’s birthday, she heads home. While Don bakes the cake, she roasts beetles. Yum. It looks like Don got a promotion – he is now a minor leaguer. I do remember the popup while Buffy was on vacation – I choose Professional Athlete for him. No more pink dance team captain uniform. Yummy – roasted beetles next to the hamburger cake. 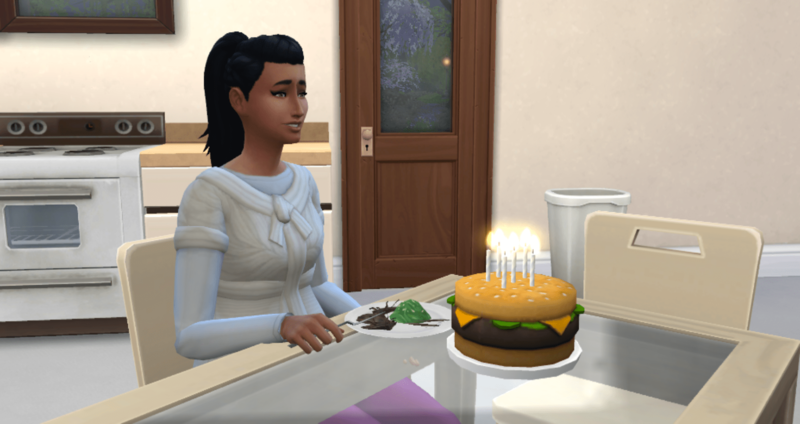 At least this cake looks better than the strawberry cake Don cooked last time. Oriel adds Creative to Mean and rolls into The Curator. Which means she will be collecting all sorts of crap – which we will be selling for cash, except for the fish and frogs which will be going to Bunny for plasma packs. 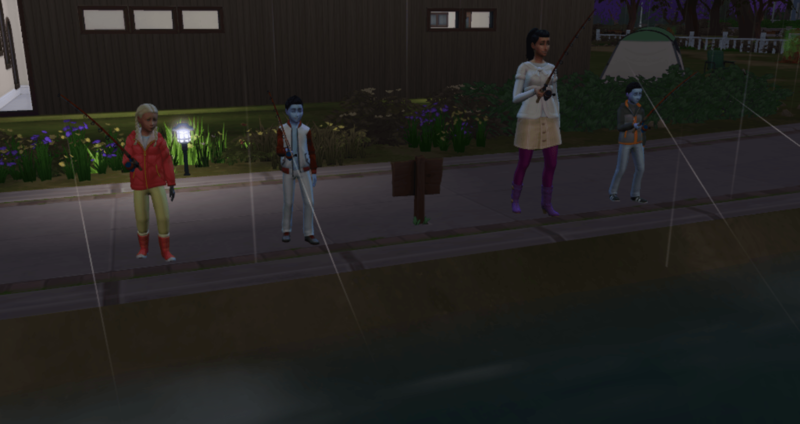 Orion adds Hates Children to Creative and rolls Musical Genius for his aspiration. This, my friends, is the leader in the polls, and he hates children. 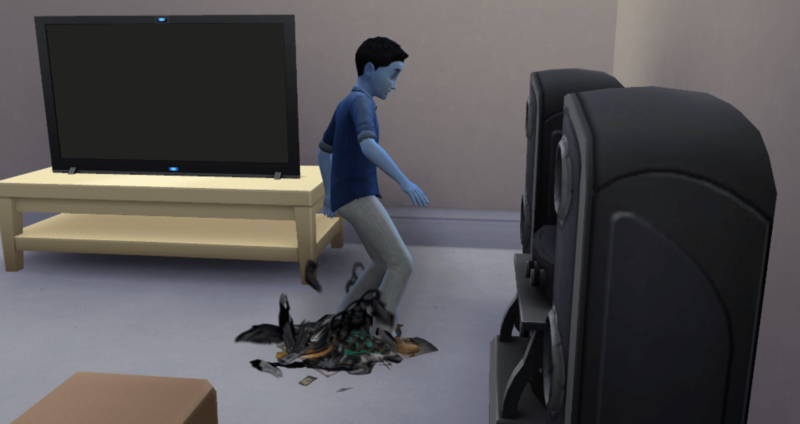 He is currently stomping around the house because he is pissed that he is sharing a room with Olly, who is still a child. We are going to have fun, lots of fun. 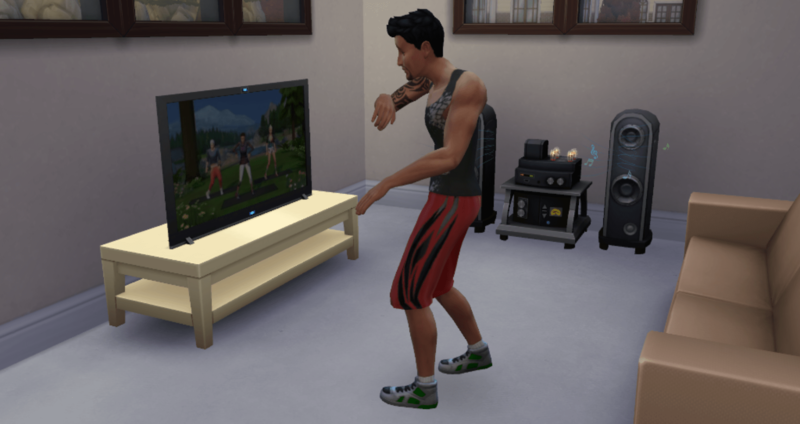 And, we still have to see what Olly rolls – because I have to complete his aspiration also. 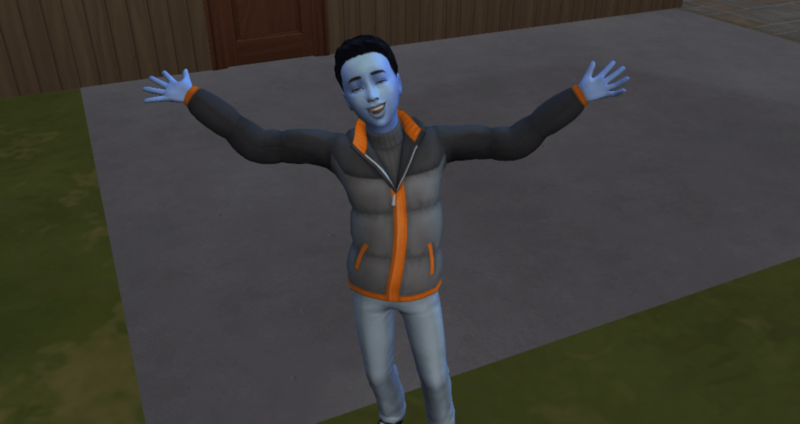 Olly has four days remaining until he becomes a teen, so we have that to look forward to next update.